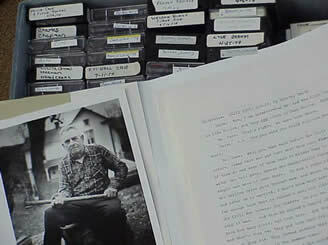 Records the reminiscences of Lola Deane, who moved to the Pine Grove area, bordering Shenandoah National Park, in 1950. The interview deals chiefly with her memories and impressions of the mountain people who lived in the area at that time. Includes references to the gardens and livestock raised by the local people, their methods of food preservation, popular holiday traditions and the problems resulting from long-term intermarriage within small communities. Several references to the works of Episcopal missionary, Deaconess Mary Sandys Hutton, occur throughout the interview. Mountain people -- Blue Ridge Mountains -- Social life and customs; Mountain life -- Shenandoah River Valley (Va. and W. Va.) -- History; Mountain people -- Virginia -- Shenandoah National Park -- Social life and customs; Rural poor -- Virginia; Country life -- Appalachian Region, Southern; Agriculture -- Appalachian Region, Southern; Food habits -- Appalachian Region, Southern; Holidays -- Shenandoah River Valley (Va. and W. Va.) -- History; Traditional medicine -- Shenandoah River Valley (Va. and W. Va.); Livestock; Consanguinity; Inbreeding; Land use -- Government policy -- United States. Pine Grove (Va.) Page County (Va.) – History; Shenandoah River Valley (Va. and W. Va.) -- Manners and customs" Shenandoah National Park (Va.) -- History, Local.